William Hill Casino is a slick ‘n’ stylish casino, bristling with your favourite games and opportunities to win supersized prizes. With dozens of quality games, live casino, roulette, video poker, arcade games and the best support imaginable, you can spin your way to a possible fortune, safe in the knowledge that you have the might of the William Hill empire behind you. Play wherever you are, any hour of the day or night, and whatever your budget – this site really does offer class, excitement, and a certain amount of panache. Don’t worry if you have never played before, because you can play for fun, and all of the instructions are there to help you. With so many new players discovering the world of online gaming, it’s refreshing to find a site where new players are welcomed with open arms. Try free slot games for fun, and once you have mastered them, have a few free spins on the roulette table…once your confidence starts building, then it’s time to put your cash on the table and try stimulating and fast-moving card games like blackjack and baccarat. Dozens of big money slots including Jackpot Giant, Gladiator Jackpot and Monty Python's Spamalot. Also the latest slots from NetEnt including Starburst and Spinata Grande if you pop over to the Games section. Roulette aficionados will love the six different tables including Lucky 8 and Bagatelle. Casino games include baccarat, blackjack, and Vegas solitaire, with two different types of video poker. Play live baccarat, live roulette, and live blackjack – watch live, and win live. Be sure to check out Three Lions – this is the official England game, exclusive to William Hill. There is a decent selection of popular arcade games like keno and virtual dogs, and there are three scratchcards. Fire games up in demo mode before you deposit, so you can get a feel for the play and bonus levels. One of the best features is the jackpot counter. Click the tab to see the rapidly-rising progressive jackpots in the main slot games. At time of press, the Triple Inferno slot was burning up at + £300,000 – this redhot slot has 16 progressive jackpots in one game. Scorching stuff. 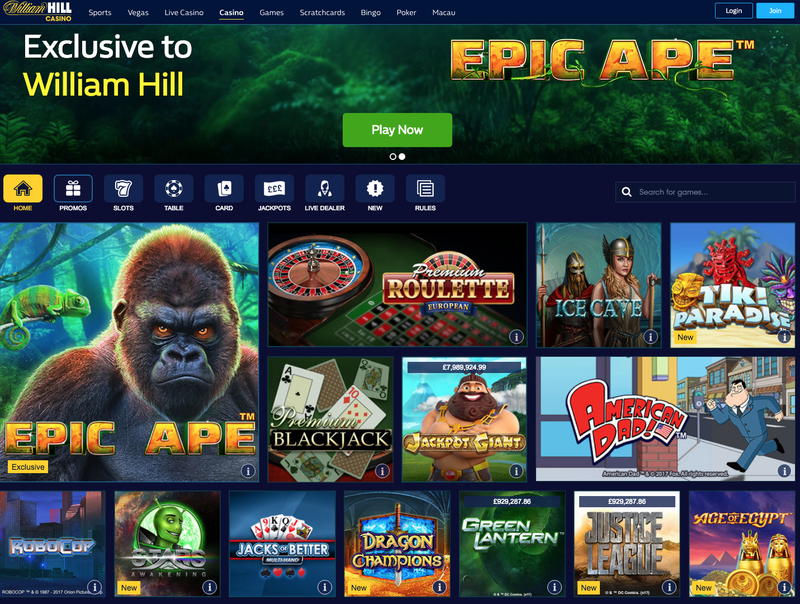 William Hill Casino is a Playtech casino with slots and games from the following software providers: NetEnt, Electracade, Ash Gaming, Cryptologic, Evolution, IGT, Blueprint and Openbet. Expect a large number of games and the very latest top titles. Visa, Quickash, PayPal, Ukash, PaySafeCard, MoneyBookers, Clickandbuy, Poli are the accepted payment methods here. To me, initial impressions of a homepage are vital, and William Hill Vegas ticks all the boxes. The site is glamorous without being trashy, yet it still manages to maintain the corporate look of William Hill. It’s easy to navigate, and there are dozens of pages to explore. A job well done by the designers. It’s a sure bet that sites like William Hill are going to be a secure and safe as they come. The site is audited by Technical Services Testing, and William Hill is committed to responsible gaming. William Hill is one of the world’s biggest and most trusted names in gaming. In 2011, they took more than £18 billion in stakes, and they employ over 15,000 people in Israel, Bulgaria, Gibraltar, and the UK. William Hill has been listed on the London Stock Exchange since 2002.